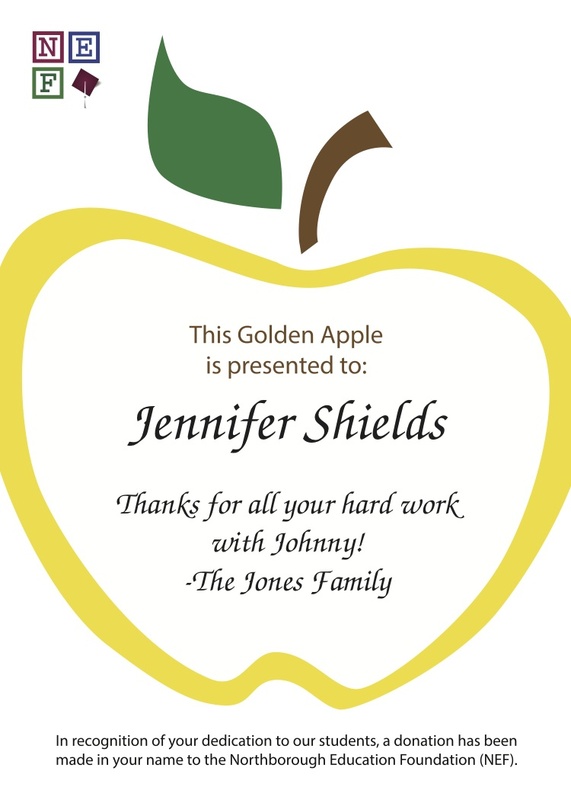 Show your appreciation for the educators who make a difference in your child’s learning by gifting them a personalized Golden Apple. Your child is surrounded by people who work to enhance their learning experience every day. Honor those who you feel deserve to be recognized… classroom teachers, assistants, specialists, librarians, office staff, nurses, special educators, or anyone associated with your child’s school experience! Golden Apple certificates are printed individually and can include a personalized message. Donations from this program provide financial support that directly funds school initiatives through the Northborough Education Foundation (NEF). NEF provides grants for unique educational programs that fall outside the realm of the annual school budget. To purchase Golden Apples online, click here. For the 2018-19 School Year, all Golden Apple donations will be generously matched by Wheelhouse Wealth Advisors (www.wheelhousewealthadvisors.com).